My research interests are in the field of dynamical systems and ergodic theory. In dynamical systems, we study how systems evolve under repeated iteration of a single function. Past work of mine includes the study of convergence for specialized ergodic averages. Convergence of Polynomial Ergodic Averages of Several Variables for Some Commuting Transformations, Illinois Journal of Mathematics, Volume 53, Number 3 (2009), 865-882. Powers of Sequences and Convergence of Ergodic Averages (joint with N. Frantzikinaks, E. Lesigne, and M. Wierdl), Ergodic Theory & Dynamical Systems, Volume 30, Number 5 (2010), 1431-1456. My recent research has been in the area of cellular automata. A priority of mine is to incorporate students in various research projects. Last summer, I worked with Sarah McRoberts to investigate a model used to describe the competition for rock space between two intertidal species. 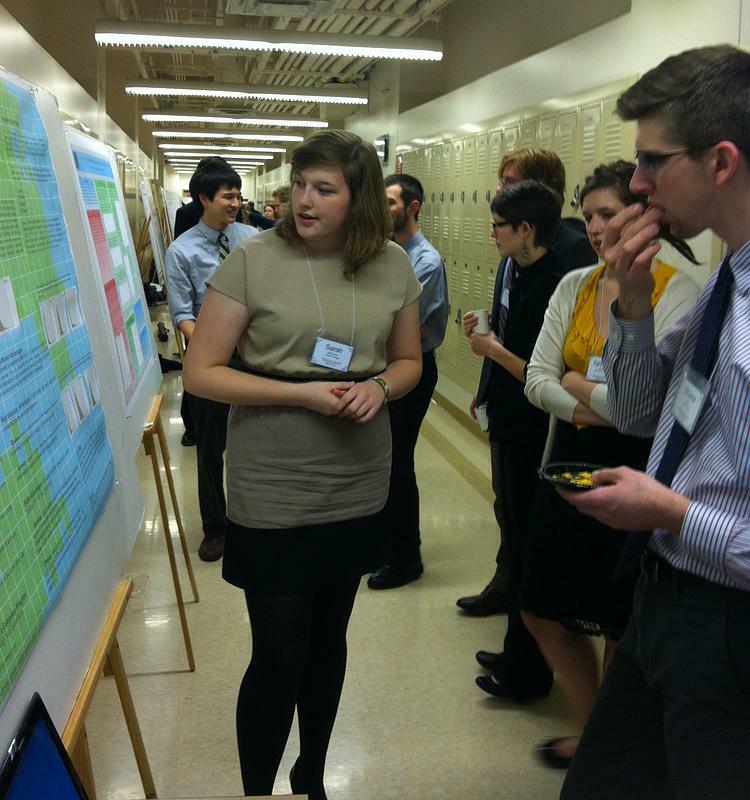 Sarah McRoberts presenting a poster titled, "Using Stochastic Cellular Automata to Model the Growth and Competition Between Two Stationary Species" at the Midstates Undergraduate Research Symposium. This summer I will be working with a couple of Luther students to investigate a model to understand the frequency of various sized avalanches in a sandpile.